Our party tent rentals have celebrated at intimate weddings, corporate and non-profit functions, private parties, conferences and festivals all over North America on private land and event venues. Our TipiMarqui™ (see photos below) is a striking large space for your wedding, dance floor, bar and lounge. Multiple TipiMarqui™ can be joined together into a unique gathering space, capable of accommodating many guests while feeling spacious and connected to the surrounding landscape. Our TipiMarqui™ can also include an indoor fire pit, which is an incredible central feature to convene around -ideal for use on cooler evenings and to add atmosphere to intimate weddings. 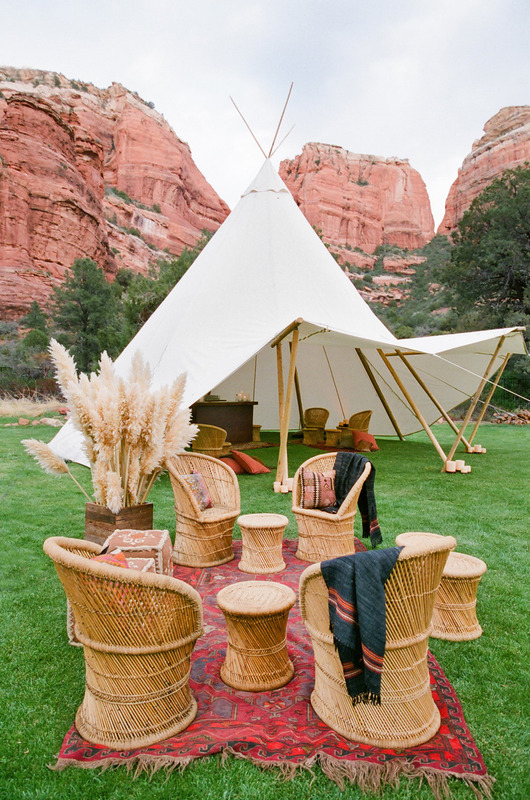 In addition, our Safari and Tipi party tent rentals can be used for all necessary stages of destination wedding packages: lounges, bride/groom/bridal party’s dressing rooms, kid’s play spaces and prep areas for catering partners at the wedding reception, etc. We can help you to create your own all-inclusive destination wedding packages, turning any outdoor environment in North America into a destination location. No longer limited to a one day affair, destination weekend weddings are in! Our glamping party tent rentals provide onsite accommodation after the wedding reception is over while letting the celebration continue. Hosting everyone close by throughout the event has become central to crafting intimate weddings. Imagine safari tents for the bridal party, a secluded safari tent for grandma, guests with families keeping the kids close by in an adjacent teepee… an entire boutique tented hotel at the same location as the ceremony and wedding reception. In addition to covering all your needs for party tent rentals, we can help with co-ordinating catering, décor, and outdoor activities customized for destination wedding packages. To top it off, add several luxury TipiBath™ for your guests because this is no ordinary event. View the most current party photo inspiration on our blog!